Captain Rick: As a Flick pioneer (2007), I was honored by my most recent photo: ‘Arizona White Bougainvillea Brilliance’ being selected for presentation on Flickr’s Explore. It produced over 1500 views of the photo shown below and over 1000 views of other photos in my photostream…now approaching 300,000 views. This white bougainvillea glistens in the sun at my Oasis in Gilbert Arizona. Bougainvillea grow vines with thorns. The actual flower of the plant is small and generally white, but each cluster of three flowers is surrounded by three or six bracts in bright colors, including pink, magenta, purple, red, orange, white, peach, salmon or yellow. Bougainvillea are sometimes referred to as a "paper flower" because the bracts are thin and papery. Captain Rick: Mount Rainier is a massive, active stratovolcano that dominates the sky over Washington State. With a summit elevation of 14,411 ft (4,392 m), it is the most topographically prominent mountain in the contiguous United States. Worldwide, only Mount Everest tops this stat. With 26 major glaciers and 36 sq mi (93 km2) of permanent snowfields and glaciers, Mount Rainier is the most heavily glaciated peak in the lower 48 states. The summit is topped by two volcanic craters, each more than 1,000 ft (300 m) in diameter. Geothermal heat from the volcano keeps areas of both crater rims free of snow and ice, and has formed the world’s largest volcanic glacier cave network within the ice-filled craters, with nearly 2 mi (3.2 km) of passages. It spawns six major rivers. Subalpine wildflower meadows ring the icy volcano while ancient forest cloaks Mount Rainier’s lower slopes. Wildlife abounds in the park’s ecosystems. I captured the original of this photo during my 5000 mile ‘Wild West Road Trip’. This post presents a breathtaking high definition image in ‘Atridim WIDESCREEN’, viewable full screen on an HDTV or widescreen computer monitor. Click the photo above for high definition viewing options via my Flickr Photostream. Captain Rick: This Great Blue Heron cools itself in the shade of a pine tree by the pond at the Civic Center in Gilbert, Arizona. Don’t be fooled…it is not looking to the right…its right eye is focused directly on me as I inched ever so close to this beautiful bird that stands over a meter tall. When I came one inch too close, this giant bird would fly with a wing span of about 2 meters. It is one of the most magnificent birds to enjoy along the canals, lakes and ponds in Arizona’s Valley of the Sun. Click photo to enjoy more info and options to view full screen in HDTV widescreen via Captain Rick’s Flickr Photostream. Captain Rick: Astronauts onboard the International Space Station restored the cool via space walks in December 2013. As an engineer and lifelong follower of NASA, the Space Shuttle and the International Space Station (ISS) programs, I am compelled to report on this remarkable event. I was fortunate to personally witness a Space Shuttle launch from Cape Kennedy in the early 1980s. The shaking of the ground and thundering across the sky was the most awesome experience of power that I have ever witnessed. I created an ‘Atridim Widescreen’ photo crop of a recent space walk (compliments of a NASA high definition original) for full screen viewing enjoyment on your HDTV or widescreen computer monitor. High Definition Viewing Instructions : Click the above photo, then the 3 dots at lower right (view all sizes) to view it in high definition via Captain Rick’s Flickr Photostream. Expedition 38 Flight Engineers Rick Mastracchio and Mike Hopkins wrapped up a 5-hour, 28-minute spacewalk outside the International Space Station at 12:29 p.m. EST Saturday, December 21, 2013, completing the first in a series of excursions aimed at replacing a degraded ammonia pump module associated with one of the station’s two external cooling loops that keeps both internal and external equipment cool. On Sunday, Dec. 22, NASA astronaut Mike Hopkins tweeted of Saturday’s spacewalk, saying, "Wow… can’t believe that is me yesterday. Wish I could find the words to describe the experience, truly amazing." A second spacewalk to install a replacement pump module occurred on Dec. 24, 2013. NASA astronaut Mike Hopkins, Expedition 38 Flight Engineer, participates in the second of two spacewalks, spread over a four-day period, which were designed to allow the crew to change out a faulty water pump on the exterior of the Earth-orbiting International Space Station. He was joined on both spacewalks by NASA astronaut Rick Mastracchio, whose image shows up in Hopkins’ helmet visor. Get connected to what is happening onboard the ISS. Watch the ISS pass over your house. I subscribe to NASA’s ISS ‘Spot the Station’ email alerts and enjoy watching the ISS frequently pass over my Arizona Oasis during the early dawn or late dusk sky, when it is the brightest and fastest moving ‘star’ across the sky. It travels at 17,000 mph at an altitude of 265 miles. If you have not seen the ISS soar overhead…you have missed a wonderful spectacle. Have you seen the ISS race across the sky? The WordPress.com stats helper monkeys prepared a 2013 annual report for Captain Rick’s ATRIDIM NEWS JOURNAL. Captain Rick: After you click the above link, the fireworks explode into the sky for each day I posted a blog entry in 2013. The more people read and commented on the post…the bigger the fireworks display for that day. I had a few really big days with lots of fireworks. It gives me blogging inspiration for 2014. Top Commenters: Sandi Bartlett, Anita Christy, Gordon Ray, Ken Bosch, Bill Whitney. (This is the most important stat to me. I sincerely appreciate the comments and encouragement they provided during 2013). 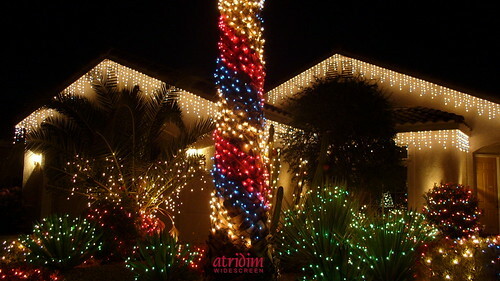 Captain Rick’s Christmas Oasis: Red White & Blue Palm, originally uploaded by atridim. Captain Rick’s Oasis lights up at Christmas time. Up to 12,000 holiday lights adorn his desert oasis every holiday season. Rumors have it that Santa uses his Oasis sea of lights as a homing beacon to guide his sleigh to Gilbert Arizona. Captain Rick: A federal judge gave approval for Detroit to proceed with its bankruptcy … the largest municipal bankruptcy in history. Billions of dollars of payments owed to city employees, retirees, investors an creditors are on the ‘chopping block’. Most U.S. municipal pension plans are on a road to eventual failure. This is a ‘wake-up-call’ for all public employees who have been looking forward to the ‘pension dream’ promised by their municipal employers. The ruling opens the door for the city to cut billions of dollars in payments that are owed to city employees, retirees, investors and other creditors. Unions and pension funds had argued that the city should not be eligible to use bankruptcy court protections. They said that regardless of the Detroit’s financial troubles, city and state officials did not negotiate with creditors in good faith in an effort to reach a deal on its liabilities. In his ruling, Judge Steven Rhodes found the city did not meet that threshold, yet he ruled that such negotiations were impractical because of the huge number of creditors, which total more than 100,000. So, ultimately, he concluded that the city filed its petition properly. Opponents have argued that pension cuts are barred by the state’s constitution. But Judge Rhodes ruled that pensions are fair game under federal bankruptcy law, trumping state law, though he noted that didn’t mean he would definitely approve cuts. As the bankruptcy moves forward, tens of thousands of workers and retirees are bracing for benefit cuts. Detroit: Its Rise and Fall … What went wrong?